The comix panel: no Andeel. Photo: Shubbak Festival. Indeed: Several of the Shubbak panels were impoverished because writers had stayed at home. The science fiction panel lacked its star, Iraqi novelist Ahmed Saadawi, who apparently was frustrated by the visa process. 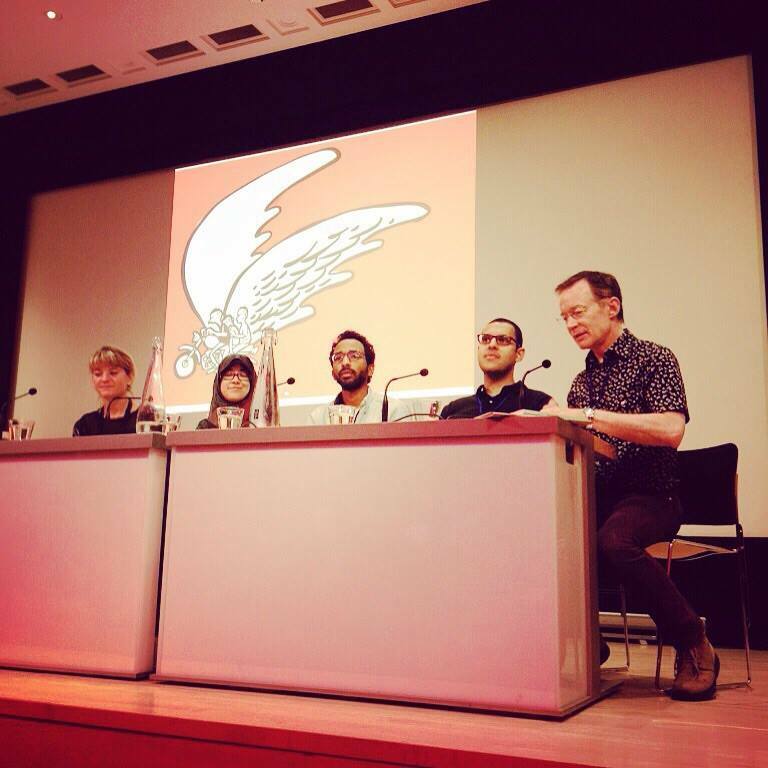 The comix panel also lacked its star, since Andeel — who has been multiply rejected for British visas — opted not to put himself through it again. “England is afraid of me,” he tweeted. Ali al-Muqri, a Yemeni novelist, was missing from the panel on “New Arabic Writing,” as time ran out to get his visa finished. He also couldn’t join by Skype, organizers said, because the internet in Djibouti was too spotty. Rasha Abbas, a Syrian writer whose visa was refused, did join a panel on writing and “extreme conflict” via Skype from Berlin . But her participation was certainly lessened, as it was difficult for her to fully engage with what was going on in the British Library conference center. Skype participations were frustrating — Ahmed Khaled Towfik was part of the science fiction panel, which he joined from Tanta, Egypt, and he dropped off the panel partway through. But Gazan writer Atef Abu Saif said in a Monday interview that we couldn’t discount these sorts of electronic participation. Abu Saif knows what it means to have his travels limited: He was trapped inside the tiny Gaza strip from 2006 until November 2011, he said, and his travels have been restricted multiple times by multiple parties. But, as he is currently in the UK doing a writer’s residency, he was able to participate in the 2015 Shubbak Festival, the only representative from Gaza. Other writers from Gaza, he said, need to participate in more festivals around the world. Organizers can’t simply accept that it’s too hard to get them out of Gaza, or too hard to get them a visa. “Doors should be opened,” Abu Saif said. It’s a mistake for festivals not to invite writers from Gaza because organizers believe the writers won’t be able to attend. “You have to invite people from Gaza,” he said. Gaza needs more literary communication, he said. “Nobody visits,” he said, and “Gazan books are printed inside Gaza,” where they are read almost solely by Gazans. His novel, A Suspended Life, was one of the few to escape the confines of Gaza, as it was published outside Gaza, shortlisted for the International Prize for Arabic Fiction, and it will be the first written inside Gaza to be translated into English. Moreover, other Arab and international writers can also be enriched by learning what’s going on with literature in a small island like Gaza. I asked Abu Saif, during our interview at the Delphina Foundation, if it was any easier for him to travel now, since he’s famous.